Tell us about yourself...we want to know more about how, where, and why you blog. Please add a link back to this Linky Party so others can join in too! We've put a button you can copy and paste into your post just below. Make sure to add photos of your bloggy chair or desk or favorite window seat! After you write a post about your bloggy-self, link up the post URL right here! 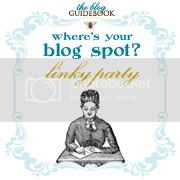 Grab our linky party button and place it in your sidebar for a while too. P.S. If you're not sure what a linky party is just read this post. It's also a great way to gain a solid readership and make new friends and find cool new blogs to read. Visit those that have linked up and leave them a comment - they'll do the same for you! Hey Lyndsay and Sarah! Thanks for hosting this linky party/giveaway! If the generic one can be removed I would have done that but I dont have access, which is understandable. Thanks for the link party! I just added my blog spot. I tried three times to link up...so either I have three entries or I'm doing something wrong!! Linky Tools may be down/not working. Check back tomorrow...try again then. I'm glad to have this chance and share just one of the projects I created with my Cricut. I love this Blog Guidebook as I have learned so much. I have downloaded the Linky thing, and I cant seem to figure out how to add it to my blog! :( I'm not sure what the heck I'm doing wrong! I'll keep messing with it! You don't have to download anything, it should appear in your browser and you just add your URL. Good luck! Yeah, you can tell by my logo I'm new to this. From the comments though, I can tell I'm not alone.